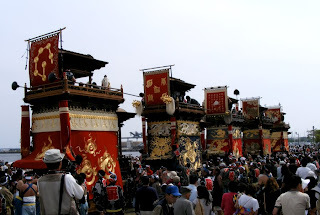 During the Golden Week I went with some friends to a village called Kamezaki (亀崎) where they have a famous festival called Shiohi (潮干 low tide) Matsuri (祭 festival). We took the JR Tokaido line from Nagoya and changed in Obu to the JR Taketoyo line (武豊線) until we arrived to Kamezaki station (亀崎駅). I fell in love with the sound of Japanese flutes so I decided to take a video. Also the sounds of the people pulling from the carriages is interesting in my opinion. So this is my first video in the blog hehe I hope you like it. 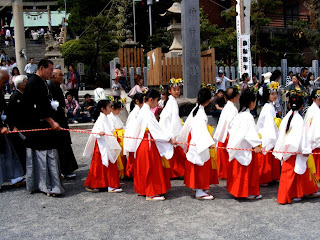 The village was full of people, some of them dressing traditional clothes, and there were lots of stands selling food. 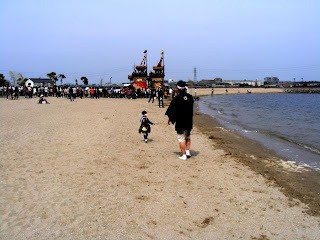 There was a small beach there and children were enjoying it. 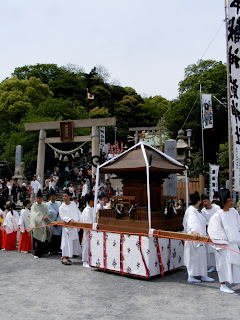 The festival's carriages were carried out from there by the some strong Japanese guys. 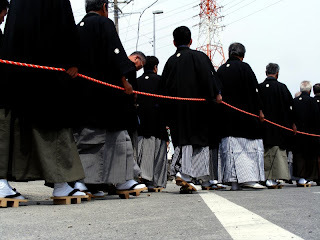 It reminded me of the "costaleros" in Sevilla's main festivities. In the picture above one of the drawings on the carriages. 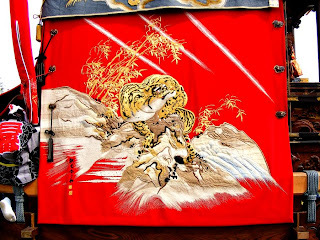 I love Japanese drawings on clothes. Nice, but I have a question: What is the "(c)" for? your music taste is unbelievable - japanese flutes, the beatles and soundtrack from conan! Y tanto que recuerdan a los costaleros, mira que hay que ser masocas jeje. Cuidadín con bañarte, he oído que las playas no son muy recomendables por allí, ¿es cierto?. Un enorme saludo Sangooo !!!! !